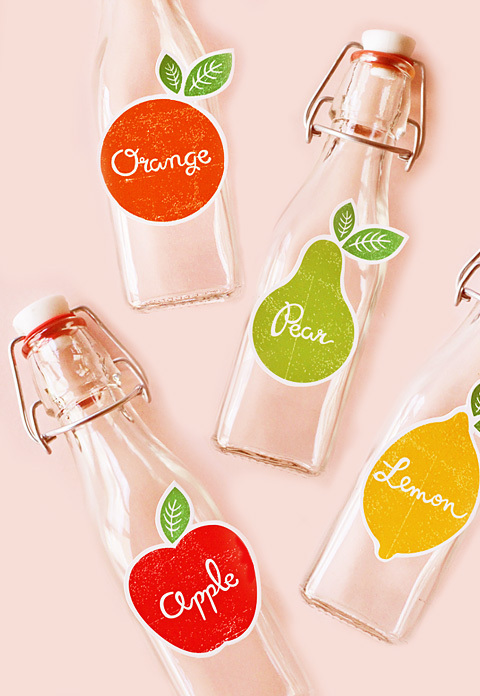 Dress up bottles of home made fruit juices, ciders, sodas or fruit infused waters with these free festive labels. Take a bright and bold decorative approach to summer picnics, home entertaining and even gifts! For a healthy option, I highly recommend experimenting with fruit-infused waters. They're incredibly simple to make, low in calories and free from processed sugars. 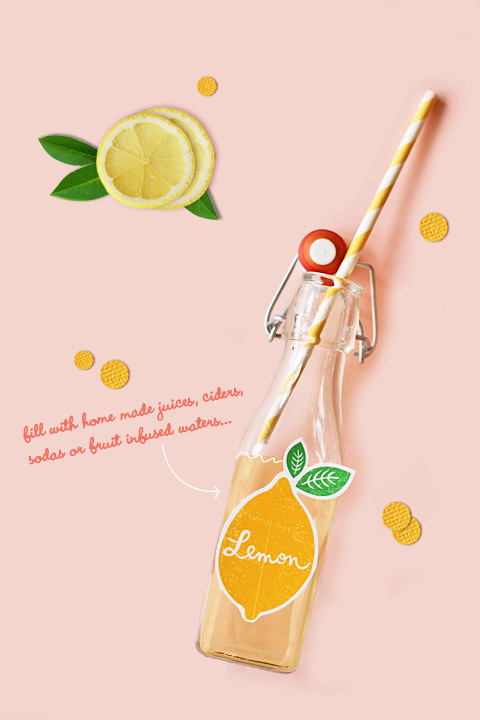 Simply pop a few slices of your fruit into a jug of water and let it infuse over a few hours or overnight. Citrus fruits will provide the strongest flavours however, this article suggests that even harder fruits like apples and pears can work well if the fruits are frozen first. I've sourced my bottles locally from General Trader. However, you can also get these 8 ounce Bormioli Rocco swing top bottles online from Amazon. If you prefer you can create bigger batches of your fruit drink in larger preserving bottles or jars. Turn these labels into hang tags by punching a hole in the top and attaching twine or ribbon then hang from the neck of your bottle or jar. There are 4 pages in this PDF document. It is over 2mb in size. If you have issues downloading please try right clicking on the download button and saving directly to your computer. Print out onto thick glossy photo paper. Cut out carefully, leaving a small white border around the edges of each label. Attach to front of bottle with double sided tape. I've kept these label designs simple and therefore open to a variety of applications. Let me know if you can think of any other interesting uses for them! Enjoy! I love this tag! Thank you!!!! What adorable tags. They would make a little party so festive! Thank you for sharing these! these are really cute :) they make me want to make juice,.. and drink it... a lot! Thank you so much for sharing these - they're great! I have a morning tea coming up they'll be perfect for. Amy, you come up with the cutest stuff! I'm telling you... I love all of your creative projects and that you share them with all of us! You're amazing. These are awesome!! Loving the bright colors and beautiful photos! Thanks Amy...for another SUPER cute printable! These are great. love them! Such a nice tags! So lovely for summer parties! These are adorable and perfect for summer! 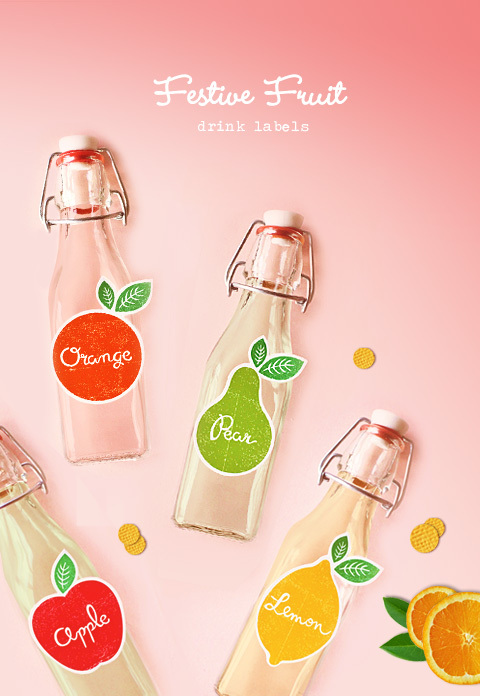 These labels are so cute! 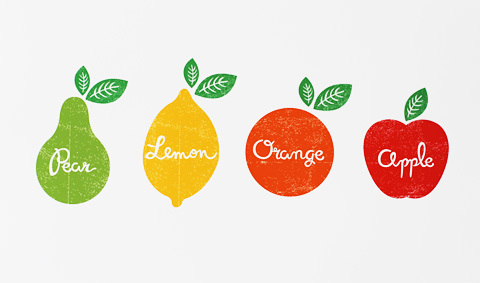 I love infusing my water with lemon - so much better than the sugar packed water you get in the shops. Very cute! Out of interest, what's the typeface in this? such a cute ideal.. i love them! Hi Tash- it's actually not a typeface, I created the lettering myself. Awesome tags Amy! Keep on working with this. I love all of the designs you did. Loving this labels! For sure I'm going to use them. Love these! I can think of tons for fun uses for these great designs. Many thanks for sharing! Oh, I love these. I think I will try printing them as stickers. These have brightened up a very wet and cold Sydney day, thank you for the generous downloads. I love your free printables and the color on these are great! Dear Amy, thanks for sharing! I would love to blog - and credit, of course - your labels. But I would need to translate into portuguese. Do you permit? Thanks Amy for these free colourful labels: just love them! it's so nice, because, IS A DIY ! i am going to print today ! PD: in my blog there ir the port of "Ice cream soda for a party or weeding"
look at it please ! Love the download. The images are so gorgeous! Thanks!! so cute..i love all the colors.. Thank you for the tags, are lovely! Thank you for sharing so freely! Several times I have been able to make a little gift or use a printout to make a card for a friend when otherwise I wouldn't have been able to. My daughter is going to have a fruit party so these will be wonderful for lables for the cordials the girls will make at the party. Thanks so much for creating and sharing! I'm going to use these in my special needs preschool classroom, for simple memory games, color matching, and maybe even for grocery store and restaurant dramatic play. I live in SA - Johannesburg, and i am desperately looking for these swing top sopda pop bottles. Can i purchase them online somewhere? They will have to be shipped to South Africa. hi, i love all the tags and colours! thanks :)! These tags are gorgeous! Thank you so much for sharing! I will be using these on some glass bottles for my son's 2nd birthday party! We are doing a book theme and it includes the hungry caterpillar! Thanks so much allowing us to print the great products you produce! love this, I made a garland for the kitchen? Wow! I dreadfully love these designs! Fruity designs! You are such an amazing woman to design this and share! OH! I forgot to mention that it'll be awesome even if I attach these on gifts or boxes. Well I must say that these tags are among the most happening and beautiful ones. Thank you for sharing such a wonderful piece of art with us, I really liked them all. Thanks for these, they are fantastic. It's these little finer details and attention to detail that make all the difference to an event in my opinion. I'm printing these out now. Thanks for sharing these with your readers! It is appreciated. I am fairly new to your blog. My Mom recently passed away. She had some items that interested her printed from your blog on her desk. It made me feel good to find them and be able to follow a blog that she found but had not had the chance to share yet. I always look forward to your email posts. They are so cheerful and make me smile! Thanks! I can't get the Free Festive Fruit Labels to download. Would you consider emailing them to me? These are so special -- thank you so much for sharing. 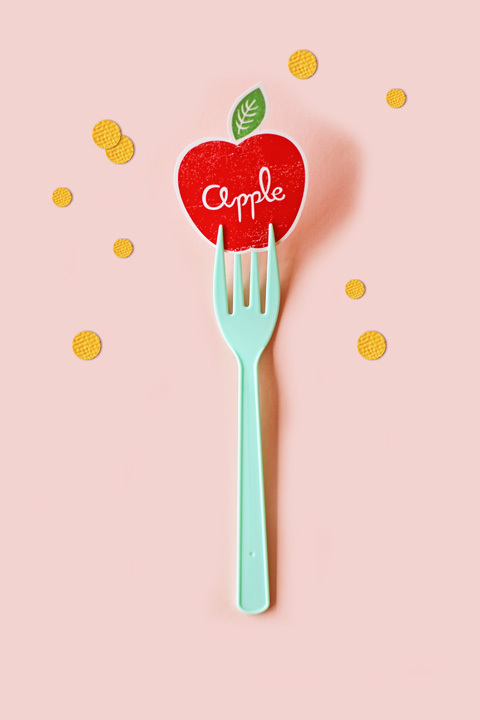 My niece has a kitchen done in fruits, and I have several ideas for using these prints. Appreciate your sharing! Sooooo cute!! thank you very much for searing!! greetings from Greece!!! Creative Labels & Innovative work! yeah, the information are amazing and the way you organize in details looks very good thank you admin. I saw a collection of these in Warsaw! Amazing finding, I didn't think about a possibility to do them by myself so you are a real inspiration! Excellent decoration tips, as well as works with some items, we are always in search of novelties. I'll keep track of this log weekly.